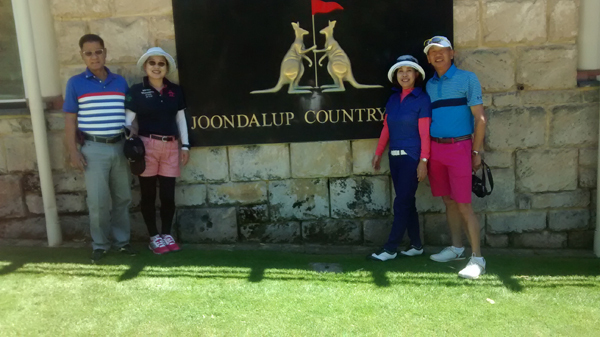 International Golf Specialists recently hosted two couples from Taiwan who were visiting Perth to experience some of the best golf courses in Western Australia. The Spring weather was perfect for each of the 10 November days that the group was here and provided ideal conditions for golf and exploring all the attractions that the city has to offer. The highlight for them, from a golfing perspective, was Joondalup Country Club. The fantastic 27 hole layout and immaculate conditioning meant the group just had to play the course again and requested another round there, which hadn’t been scheduled in their original itinerary. Of course, arranging an extra 18 holes at one of Australia’s best courses wasn’t a problem for the IGS team and the enjoyment of Joondalup Country Club for a second time added to the great golf the group also experienced at Araluen Country Club, Meadow Springs and The Vines. On their time away from the golf courses, spending a couple of hours at Kings Park gave them a great view of the city and Swan River and was a good way to put the layout of Perth into perspective. A relaxing ferry ride from South Perth to the newly created Elizabeth Quay provided some photo opportunities for the shutter enthusiasts amongst them, and then it was time for a refreshing beverage at one of the open-air bars dotted along the waterfront. One of the most popular destinations for people visiting Perth is the Swan Valley - home to many of Australia’s best vineyards. Mandoon Estate produces great wine and beer and has options of casual dining or fine dining in their restaurants. Prices are reasonable, and the buildings and grounds provide a great day out in a beautiful location. One of the most rewarding parts of planning and providing a tour for our guests is the positive feedback we have from them. The IGS team strives to put together the perfect golf holiday of tour and we are finding that repeat business from previous guests wishing to revisit a favourite destination, or plan their next adventure at a new one is steadily growing. We are already beginning to plan a 2018 Tasmanian experience for this group and they will also be back to Perth again, such has been their enjoyment of the golf and city. If you have a destination you would just love to visit to experience the golf courses and attractions on offer, speak to the guys at IGS and have them do the hard work for you. With over 40 years of experience in the tourism industry, a love of golf travel, an in-depth knowledge of our destinations and great golf and hotel rates, IGS puts together the best tours and packages available. Thailand, Vietnam, Bali and Singapore are just some of our most popular Asian destinations. South Africa, Mauritius and New Zealand offer great golfing getaways and there are also a huge number of courses around Australia that combine amazing golf with fantastic local attractions. Whatever your requirements, speak to the friendly team at IGS today. Perth is a vibrant, energetic city that offers a truly unique Western Australian golfing holiday experience. Golf in Perth is truly a remarkable experience, with several listed top 100 golf courses in Australia. Perth offers not only a fantastic golfing beauty, but a great place to travel for its beaches, wineries, night life and Casino. With more hours of sunshine than any other major city in Australia, Perth has the ideal climate for year round golf at some of the most impressive golf courses in the world. Home to the European PGA tournament, The Perth International, Lake Karrinyup Country Club is currently ranked #7 in the Golf Digest Top 100 courses in Australia. There are another 10 courses in Western Australia rated in the Top 100, including internationally recognised courses such as Joondalup Country Club, The Vines Resort and Meadow Springs Country Club. There are great five star resort courses where you can stay and play, or hotels like the Crown Perth with its sophisticated accommodation, restaurants and casino. Apart from great golf, you can immerse yourself in an eclectic mix of city culture and stunning nature, from Perth’s burgeoning bar scene and open arts festivals, to its world-class beaches and expansive parklands. Head south to the port city of Fremantle where the fascinating maritime history blends with an open, multicultural energy. Take a short ferry ride to Rottnest Island, a city escape for swimming, fishing and relaxing. Venture inland to the Swan Valley, Western Australia’s oldest wine growing region. Scenic vineyards, produce farms, and art galleries speckle the valley, creating a feast for the senses. Discover the vibrant and exciting atmosphere of a golfing visit to Perth – “a great golfing experience”! Managing Director Gary Allomes has been a member of Melville Glades Golf Club in Perth, Western Australia for over 24 years. Gary is a keen and capable golfer and is currently the President of Melville Glades and has served on that Club’s Board for over 5 years now. International Golf Specialists is also a Gold Sponsor of Melville Glades, and we have many clients who are members of this private golf club, who travel with Gary on his exclusive and hosted golf tours. Gary also hosts many of our Perth, Western Australian golf tours, where he has excellent relationships with the leading golf clubs in Perth. This can include access to both public and private clubs with services such as preferential tee times, golf tuition and tournament organisation. There are some great international standard public access golf courses in Perth such as the Joondalup Country Club, The Links Kennedy Bay, The Vines, Araluen, Kalgoorlie Golf Course, Meadow Springs and The Cut, however Gary can also arrange rounds at private clubs such as Lake Karrinyup Country Club , Mt Lawley, Cottesloe and even his own club, Melville Glades. Having someone that is local to handle all of the arrangements on an exclusive Perth golf tours cannot be underestimated. From local knowledge on the best courses for the different seasons, to providing private transfers and recommendations on best touring, entertainment and dining for a group will ensure your golf trip is enjoyable and hassle-free! Being Perth based, International Golf Specialists are experts in arranging and hosting golf groups, and is the leading golf tour operator in the state. The Managing Director, Gary Allomes said “we know our local courses better than anyone else and we have the best arrangements with the top golf clubs. Dealing with the local operator has real advantages such as preferential tee times & seasonal rates, which allow for great golfing all year round”. For more information about the amazing experiences to be enjoyed on West Australia’s golf courses, please make sure to get in contact with International Golf Specialists today to begin planning your next golfing holiday. We can tailor a golf package to suit your personal requirements, needs and wants. Golf is one of the few sports that you can ‘take anywhere’ and enjoy playing the same game throughout the world at a totally different setting. Unlike a soccer pitch or tennis court, every golf course is different. Add in the variations of climate, terrain and surroundings throughout the courses around the world and you’ll probably agree that the game of golf truly is unique in the world of sport. Wherever you would like to play, International Golf Specialists can arrange a golfing holiday to your dream destination. Whether you are visiting Perth for the first time and want to take in world class golf at Joondalup Resort, Kennedy Bay or The Vines Country Club, we can tailor an itinerary specifically to you. Or perhaps you are about to embark on your yearly getaway with the family for some R&R and want to take in some of the world renowned golf on the holiday island of Bali - the team at IGS can take care of all your travel, accommodation and golfing requirements. Working with the best suppliers and courses throughout Australasia, Mauritius and South Africa, we can accommodate travelling parties of all sizes and requirements. Non-golfing travel partners will benefit from our personal knowledge of each destination, allowing them the opportunity to soak up all the attractions that are on offer, while the golfers experience the best golf courses and resorts in every location. To begin planning your next golf adventure, speak to the experienced team at International Golf Specialists today. Perth’s reputation as an amazing golf holiday destination is growing every year with the city seeing a huge increase in golf related holidays - often combined with business trips from overseas and interstate. For visitors to Perth, International Golf Specialists takes the hassle out of having to arrange golf and accommodation, and being local means we know the best courses and times to play and the most convenient of accommodation. Our experience in the travel industry and passion for tailoring the best possible golf holiday means our guests are always well golfed and completely relaxed at the time of their departure. 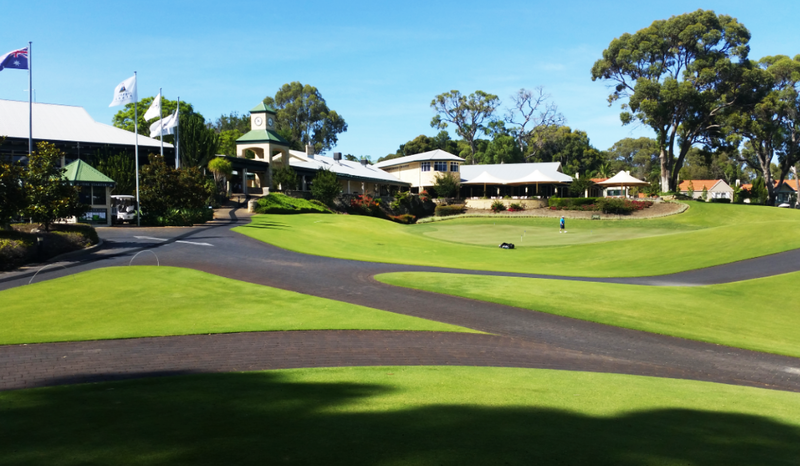 Perth visitors are treated to fantastic golf at some of the country’s best courses and resorts. A golfing holiday here can be as easy as walking out of your room and stilling up to the first tee at the world renowned Joondalup Resort, or can be spiced up with the challenging links style layouts of Kennedy Bay and The Cut. Throw in rounds at Araluen Resort, Meadow Springs and The Vines and you have a world class golf holiday to remember. There are so many great golfing experiences and incredible attractions away from the course, and International Golf Specialists will create a personalised tour for you to take advantage of everything in the area that appeals. So come and take in our amazing beaches, our vibrant city, our great golf courses and take with you your favourite West Australian wines, so many new golf memories and a desire to return to experience it all over again. One of International Golf Specialists most popular destinations is to our home town of Perth. The golf here is fantastic and our recommendations for activities after your game make for a memorable holiday. Joondalup Resort has 27 holes of golfing splendour. This is a must play course when visiting Perth and is only 20 minutes from the CBD. After a round here, check out Hillary’s Boat Harbour, just a short drive from the course, to take in a relaxing meal at one of the many restaurants along the waterfront. Araluen Resort in the Perth Hills has 18 of the best holes anywhere in Australia, which wind their way through the West Australian bush. The Par 3 16th will always be a talking point. Its elevated tee provides a challenging shot to the green below, as well as some impressive hang time as the ball makes its long descent. A visit to the nearby Araluen Botanic Garden continues the natural experience. This is a truly beautiful and relaxing area and will certainly cap off a fantastic day of golf and unwinding. To begin planning your Perth golf adventure, speak to the guys at International Golf Specialists about all the great courses and attractions we can include in your itinerary to make your golf holiday here the best it can be.